Humanity Healing Foundation – Africa, HHF-A, is a Ugandan registered Community-Based Organization operating under the auspices of Humanity Healing International in the United States and with the same vision and Mission Statement. HHF-A is staffed with local and regional leaders who bring a thorough understanding of the issues facing Sub-Saharan Africa and through their experience and synergy with HHI, our overall organization will be able to effect greater change. Future Victory School. Future Victory School (“FVS”) is a private educational institution, licensed by the Ministry of Education and Sports. It was established in the year 2000 as a response to an avalanche of orphans created by AIDS and the Civil War in Uganda. Currently, there are 320 students enrolled, 150 of which are orphans, 10 are HIV+, and 4 are disabled. HHI both sponsors FVS and utilizes it to optimize new programs before rippling them out. IDPERRI. IDPERRI, Internally Displaced Persons Empowerment, Resettlement, and Rehabilitation Initiative, is a long-term project of HHI and is still in the conception and planning phase. It is an innovative approach to the IDP crisis in northern Uganda. After 22 years of war, there are many in the IDP camps that have no home to return to, and those that do, often do not have the means to rebuild their lives. Through the building and development of a model eco-village, the new inhabitants are trained in an entirely new industry: the resettlement of other IDPs. These first-wave former IDPs will then help the second-wave IDPs, whose cost for assistance is to help with the resettlement of other IDPs, and so on. The project is built on the understanding that the best way to rebuild a sense of community is to help others. While the pilot project is targeted for northern Uganda, the Initiative can be quickly adapted in response to resettlement crisis anywhere in the world. Educational Empowerment. Uganda is a nation where the median age is 15. Only through education of its children will the country begin to reach its potential. HHI is working on several projects in this category. 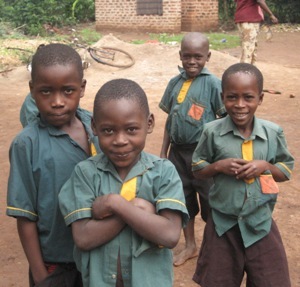 These include the Uganda Outreach Vocational Training Center and the Environmental Education Initiative. Women & Family Empowerment. When women and families are empowered, communities are Healed. HHI is working on several projects in this category. These include the Pads for Schoolgirls Project and the Community Farming Project. Prison Initiatives. HHI is working in partnership with the Public Defenders Association of Uganda to target Human Rights concerns and advocacy; in particular embracing the goal to change the current application of the practice of remanding people to prison, which holds them in custody without time limits.